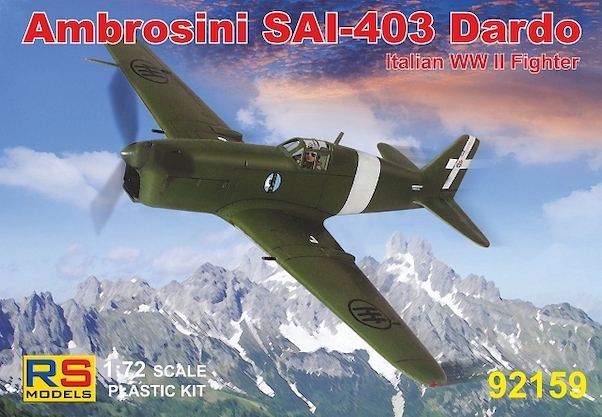 The Ambrosini 403 Dardo appeared in late 1942, developed from the S.A.I.207. The 403 differed by having a later series of 750-hp Isotta-Fraschini Delta V-12 aircooled engine. The airframe was of all-wood. The Stefanutti-designed S.403 flew for the first time in January 1943, powered by an Isotta-Fraschini R.C.21/60 engine of 750hp which provided a max. speed of 648 km/h. The armament was two 20-mm MG 151 cannon in the wings and two 12.7-mm Breda machine-guns above the engine. The Dardo--C was to be a long-range version with increased internal fuel and two drop tanks. An order for 3000 was placed, but only the prototype flew.